We at Luxe have several great solutions to help you battle blow dry heat, hair dryness and frizz! The epic monsoons these days causing your hair to frizz? Isn’t it bad enough that when it is 107 degrees F and hotter out that you have to blow dry anyway? We at Luxe have several great solutions to help you battle blow dry heat, hair dryness and frizz! 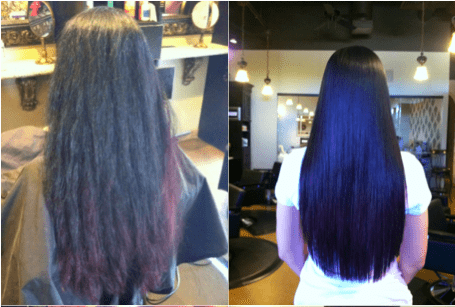 Before we talk about them, we’d like to explain the difference between straightening systems and smoothing systems. There really is no true “straightening” system. What really happens is that the treatments revitalize and rejuvenate the hair leaving it softer, smoother, and in a healthier condition. There is dramatic reduction of frizz and curling, making hair easier to manage, thus reducing the time to style. It will be significantly softer, straighter & shinier and smoother, leaving your hair in an overall stronger condition. So the true answer is that the terms are interchangeable so long as clients understand that not all heads of hair will end up looking like they have just been flat ironed. Because we are constantly seeking the best products for your hair and your health, our systems of choice change from time to time. We strongly suggest you call and schedule a consultation and inquire as to which systems we are currently offering. These services start at $253+. Call us for more information.